Our full size Wide Range Humbuckers are essentially the same thing as our standard humbuckers, but with a classic Fender Wide Range look. 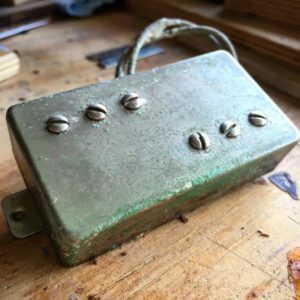 Just like our standards, we can power these pickups with your choice of A5 magnets for a traditional PAF tone, A8 magnets for a modern hi-fi bell-like tone, or Filtertron style magnets for a twangy PAF/Gretsch tone. Your choice of output levels and covers. Along with the default Silver/Nickel covers, we offer custom relic options and regularly post new covers on Instagram and Facebook. The Wide’tron is a unique animal. It’s crazy mashup of our standard PAF-style humbucker, Gretsch Filtertron, and Fender Wide Range pickup, borrowing the best elements of each to create a twangy, punchy, full-sounding pickup useful in just about any style of music. Killer for cleans, ambient, country… or stomp on some fuzz without fear of hum or buzz. Best of all worlds – and looks cool too! 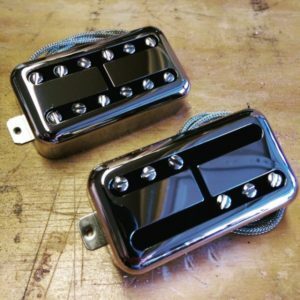 The Wide’Tron is a direct drop-in replacement pickup for humbucker sized routes and is available in 12 screw, 6 + 0, 3 + 3, or solid black, in silver/nickel or gold covers. All options sound and function the same. It’s purely cosmetic. We can wind them to vintage/low (5.5-7k), medium (7-8.5k) or high (8.5k +) outputs. Calibrated sets of 2 are available (and recommended!). Our Wide Range Mini Humbuckers are direct drop-in replacements for standard minis or for p90s when used with mounting rings. 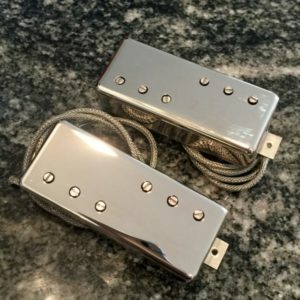 Minis tend to have more snap, bite and top end than full size humbuckers and are great pairings with darker guitars or for players who value crisp and cutting high end in their tone. The Wide Range magnet arrangement has very little effect on the sound (vs. a standard mini humbucker) and is mainly cosmetic. You can choose from A5 magnets for a more traditional Gibson tone or A8 magnets for a much more hi-fie sound, with amplified highs and lows. The A8s ring like a bell, and can be would to low/vintage output specs without loosing any punch at all. Don’t be fooled by lower DC ratings – even a 6k output A8 mini will be loud and proud and works like a dream with fuzz and OD pedals.